Which Country Pays the Most for Its Teachers? These figures show how much teachers get paid on average each year in dollars, averages gathered over 15 years. This entry was posted on September 15, 2014 at 9:43 pm and is filed under Teachers Salary. You can follow any responses to this entry through the RSS 2.0 feed. You can leave a response, or trackback from your own site. 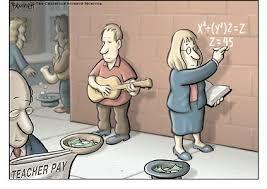 Interesting article on worldwide teacher salaries. Without any data on the relative cost of living the above figures are meaningless.